If you are using the iCloud add-in to sync Outlook's Calendar and Contacts with iPhone and sync is not working, verify it is enabled in File, Options, Addins. To enable it, click Go at the bottom of the screen then tick the iCloud add-in. If it's disabled every time you restart Outlook, you'll need to check the registry to enable it. LoadBehavior should be set to to 3. To change it, double click on Loadbehavior (or right click on Loadbehavior and choose Modify) and enter 3 in the Value Data field. 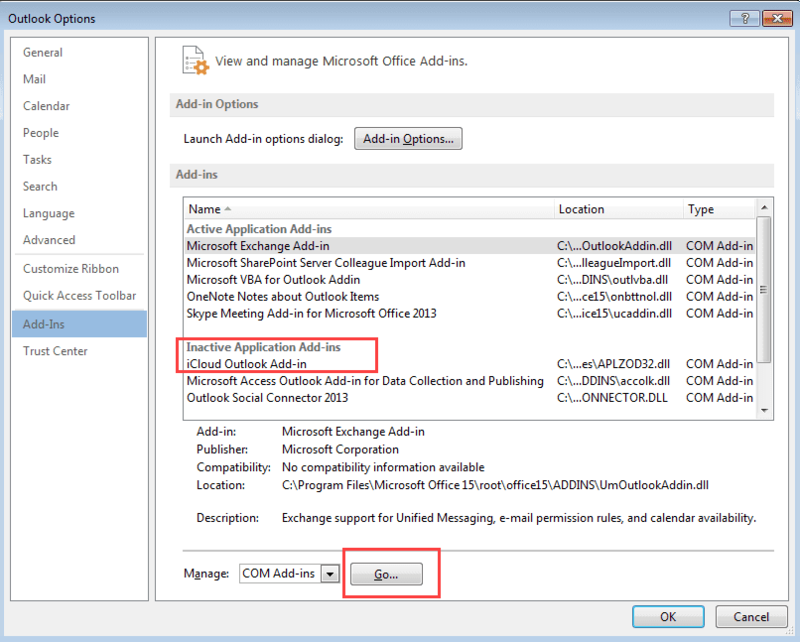 Restart Outlook and verify the addin loaded. (If keys in the path don't exist, you'll need to create them). Right-click on addinlist, then add a new RG_SZ registry value named Apple.DAV.Addin and enter a value of 1.
why is my messages in iCloud disabled? The email messages in your @icloud address? In what way are they disabled? So he is using icloud to sync with outlook? Is the icloud addin disabled in outlook when it stops syncing? look in file, options, addins. Any suggestions if I don't have Apple.DAV.Addin at all, and don't see iCloud Outlook Add-in anywhere, not even under "Disabled"? I have already Repaired, Uninstalled, & Reinstalled iCloud on Windows and it still doesn't show up anywhere. Any help would be appreciated! What version of windows and outlook are you using? Did you open the icloud settings and sign out then back in? Windows 10, Office 365/Outlook 2016. I did sign out & back in again. Are you using an administrator account or a user account? The default for consumers is administrator but some people like to tighten security and use a separate account with just user permissions. Using a standard user acct might require running outlook using 'run as administrator' to work. Are you using the default user account windows created or a limited user account? If you open outlook using run as administrator (hold shift and right click on the outlook shortcut then select run as admin), does the icloud addin show up in outlook? I am using a limited user account as this is my work laptop. The iCloud addin does not show up in anywhere Outlook, not even under Disabled. What is the actual DLL file name? Perhaps I could manually add it. the dll and path (in 8.3 format) is C:\PROGRA~2\​COMMON~1\​Apple\​INTERN~1\​APLZOD.dll - that *should* find the dll but i don't know if it will actually work.... but its worth a try. The only thing I was able to do to successfully fix this issue was repair Office 365. Once I did that, the add-in showed up again and is working fine. Thank you!